Last week I shared some love-filled recipes for Valentine’s Day. 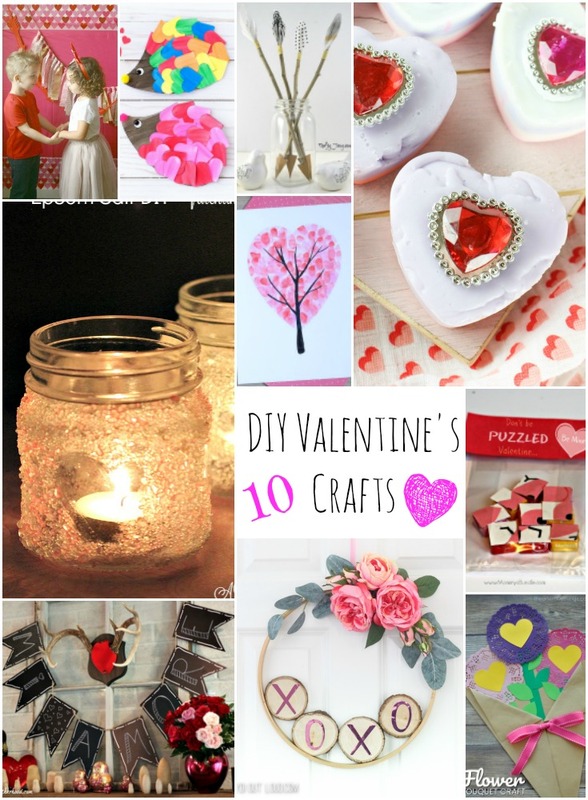 Today I’m sharing some DIY Valentine Day crafts. From the front door to the mantle, and a few to enjoy with the kids, these valentine day crafts will bring the love straight into your home. Everyone knows that the best place to decorate a home is the mantle. This Valentine Mantle Sign is easy to recreate, and the best part is that you don’t have to have a mantle to hang it on! Add Thrifty Jinxy’s DIY Cupid’s Arrow Valentine Decor and some Epsom Salt Candles in this tutorial for a mantle full of love. This DIY Valentine’s Day Hoop Wreath from Lydi Out Loud can either welcome friends at the front door, or be paired with the mantle decorations around the house. The XOXO wood pieces add a fun touch necessary for any Valentine day crafts. When celebrating holidays with kids, it’s always fun to get them dressed up for pictures. With a Diy Valentine’s Day Photo Booth from See Vanessa Craft you’ll be ready to take those photos and share them with friends and family. Then get the kids involved in making a DIY Puzzle Valentine for Kids from Mommy’s Bundle that they can pass out with their special pictures for a gift of love – and a bit of yum. I personally love having themed crafts for the kids after school. I’m loving the Heart Hedgehog Craft from Fireflies and Mudpies, and can see myself framing a Valentines Day Heart Fingerprint Tree from Easy Peasy and Fun to pull out year after year. Finally, these Valentines Day Paper Flowers Craft from I Heart Crafty Things remind me of some paper flowers with love notes one of my kids gave me in a past year. Flowers and valentine’s day will always go hand in hand. In return, I know my kids would love to find their own DIY Valentines “Bling” Soap from Busy Being Jennifer as a gift that says “I love You” from mom. So many cute ideas! Thanks so much for including my wreath!